During the breeding season, frogs are often easy to find: just follow sound of their songs. But where do they go outside of the breeding season? While a few frogs, like the bullfrog, stay around their ponds, many other frogs move far away from where they breed. Finding out where they go is important – to protect these animals, we need to know all of the habitats that they use through their entire life cycle. If we fail to protect the habitats where the adults spend their time, it doesn’t matter how well we protect the breeding habitat where tadpoles develop. Without adult habitat, the amphibians won’t make it. The pacific chorus frog is conspicuous during the breeding season, but hard to find the rest of the year. Like some other amphibians, they likely spend a lot of time underground, living in rodent burrows. But they turn up in other places too. I fondly recall a few pacific chorus frogs that lived in the tank of a field station toilet, and clambered out of a crack in the lid with each flush. Brattstrom and Warren (1955 Copeia) remarked on finding forty adult pacific chorus frogs living inside of an old cattle skull. But some of the most interesting hideouts for these frogs are high above the ground. Pacific chorus frogs are in the treefrog family, and one of their distinguishing characteristics is the presence of toepads that help them to climb. The use of arboreal habitats in Pacific chorus frogs was demonstrated in a paper by Forsman & Swingle (2007 Herpetological Conservation & Biology). They examined over 1,400 tree vole nests in Oregon and California. They also searched through old field notes and records archived in natural history museums like the Slater Museum of Natural History, the Museum of Natural History of L.A. County, and the California Academy of Sciences. Between these historical records and their own observations, they found quite a few records of amphibians in vole nests. These were mostly salamanders like the arboreal salamander, but several pacific chorus frogs were also noted in tree vole nests. The nests containing frogs ranged in height from about 5 to 20 meters above the ground. So these frogs were capable of going quite high! Near the end of their paper, Forsman and Swingle remarked that remote infra-red cameras might be a valuable tool to study amphibians in vole nests, but with the caveat that this is a labor-intensive way to collect data. Their comment was auspicious – only a few years later, cameras focused on eagle nests and observed remotely by a cohort of citizen-scientists are providing insight into the tree-dwelling habits of pacific chorus frogs. I heard about the frogs in the eagle nests when Kathryn Fitzgerald Shramek sent me an email. The images on the left are a few of Kathryn’s screenshots that show the pacific chorus frogs in the nests. Intrigued, I followed the links to find a community based around live feeds from cameras focused on eagle nests high in the trees. The cameras were set up by the Institute for Wildlife Studies for the purpose of watching the eagles. The Humboldt Bay Eagle Nest Cam feeds are shared online with the public; anyone with an internet connection can peek in at the eagles’ nest. While watching the cameras, you can communicate with fellow nest-watchers through their Humboldt Bay Eagles Facebook, chat and an online forum. Although the cameras were initially set up to watch eagles, people began to notice frogs in the nests. This was a significant observation, because it was the first time pacific chorus frogs were noted in eagle nests. However, data collection has progressed byeond solely documenting the presence of the frogs. Jim Campbell-Spickler is the biologist leading the citizen-science study of the frogs in the eagle nest. He developed an online form (see image to left) that nest watchers used to enter data about frog sightings. The information collected through the form included the local time, number and location of frogs observed, insects observed, and other variables. Jim and the citizen-scientists have gained a more detailed view of what the pacific chorus frogs are doing in the nest. These data will be published in a scientific journal later this year. For now, they are no longer using the online form to collect data on the frogs. But they plan to continue the work with a new data collection procedure in the future. You can learn more through the Humboldt Bay Eagle Facebook group or online forum. Ultimately, their work will provide wonderful insight into the role of eagle nests in the lives of pacific chorus frogs. Below is a video from eagelwhisperer18 showing the frogs as they hop about the eagle nests at night. This research also raises further questions. Do the frogs seek out eagle nests specifically, or are they just as abundant (and active!) high in the canopy of trees without nests? Do pacific chorus frogs spend time in the nests of other birds? 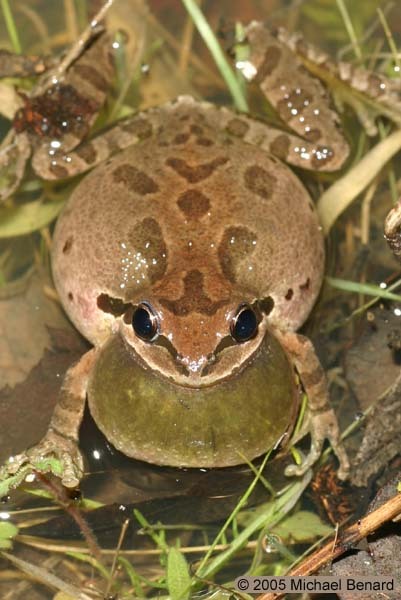 Certainly some raptors, like red-tailed hawks, will actually eat pacific chorus frogs. Do they avoid some bird species? Do the frogs provide some benefit to the eagles? This work wouldn’t be possible without the efforts of the citizen-scientists collecting data. Why would they spend their time watching these animals online? I asked Kathryn this question, and her answer indicated the importance of an affection for nature and a good community of fellow online naturalists: “I watch because I love all wildlife and this gives me an opportunity to view the bald eagles in their nest doing their thing to raise their offspring. I enjoy the friendships I have made chatting with others who share an interest in these wonderful birds.” You too can join this community; just direct your browser to the cameras, and start watching for the frogs and eagles! Note: Maintaining these cameras costs money. In setting up the cameras, IWS received funding from the Humboldt Wildlife Care Center and the Sequoia Park Zoo. You too can support the eagle cams and the people who make them possible through donations to the IWS. This entry was posted in Academic, Citizen Science, Natural History and tagged California, citizen science, Frog, methods, Natural History, pacific chorus frog. Bookmark the permalink.